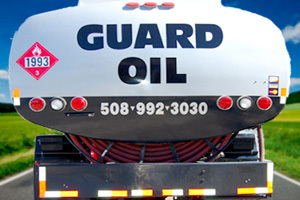 Guard Oil provides heating oil to commercial buildings, along with diesel fuel for business needs. Diesel fuel, and oil for diesel and utility vehicles, lubricants and hydraulic oil for industrial machines, and even fuel delivery for large boats and ships (see our Marine page). We offer competitive pricing for all of your commercial fuel needs and provide clients with reliable, first-rate delivery. From Cape Cod to Providence, Guard Oil provides on-time delivery and quality services to our clients. When you trust Guard Oil for your commercial fuel needs, you get the peace of mind that comes in knowing that you chose the best company for the job. We offer 24-hour next-day delivery options for all orders, and with our huge fleet of dedicated trucks, we can guarantee delivery regardless of the weather or increased seasonal demand. Give us a call today and get a no obligation quote from Guard Oil for any of our top-rated commercial services. Our friendly and experienced team members can help you get the best services at the best price available in the Southeastern Massachusetts and Rhode Island region. Call today at 508-992-3030 to speak with one of our customer service agents.